We only wish to raise quality of life, for all species. 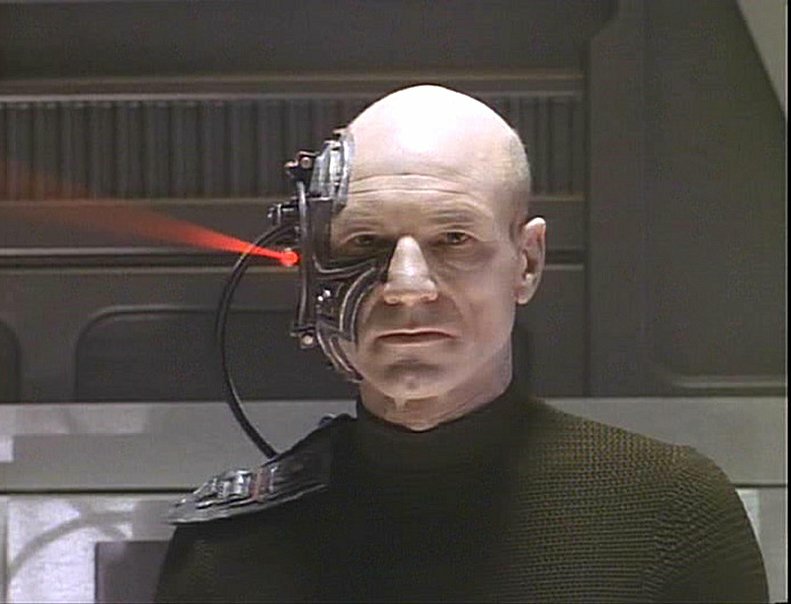 Proud to say I am a Star Trek fan, specifically a TNG girl. So, here's Captain Jean-Luc Picard during one of his off-days as an tricked out Borg. This two-part episode will be released in select theaters soon for a day or so, and even though I've seen it a million times, it's tempting to check it out on the big screen. Below are process pics of the sketch. I've seen the process of other artists, usually a graceful ballet of brush or pencil strokes which evolves into a beautiful piece. I am the first to admit, my process is a train wreck. Nonetheless, with patience and persistence, it still yields postable results. This is the source image I began with. I also referenced others with a brighter red light. I first lay down preliminary lines. Then, I start to fill in the eyes, nose and mouth area. Fill in more features. This is the point where I'm wondering where it's going. 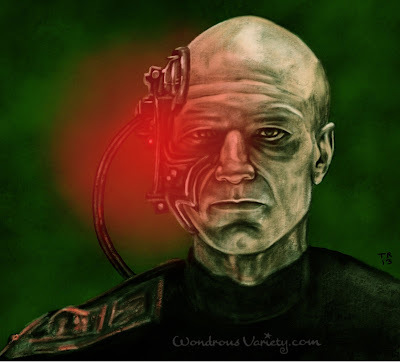 I start to tackle the Borg hardware, then notice poor Locutus has cranial swelling. Time to remeasure. Fixing up my proportions, Locutus is back on track. Adding details and further tweaking. Once I'm satisfied with a black and white sketch, it's on to coloring. It's easy to get spoiled on the iPad or any digital device, where you can do infinite corrections and changes. Tactile media forces you to make more of a commitment. I'll be returning to traditional painting and drawing soon, to see if these exercises have strengthened the "perceptual" muscle. At least, I've saved some trees in the meantime. I'm old enough to know that a longer life isn't always a better one. In the end you just get tired. Tired of the struggle. Tired of losing everyone that matters to you. Tired of watching everything turn to dust. If you live long enough, the only certainty left is that you'll end up alone. 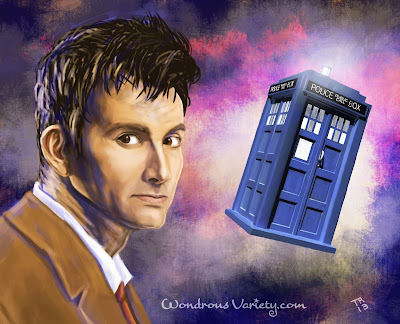 In celebration of David Tennant's return to BBC with "Spies of Warsaw", this iPad portrait exercise features the Tenth Doctor and his magical time box.